My colleague Dr Paul Long and I have been working on a project to analyse the way popular music history is represented on television. The latest stage of that project has been work on what is probably the first documentary history of pop music on British television. 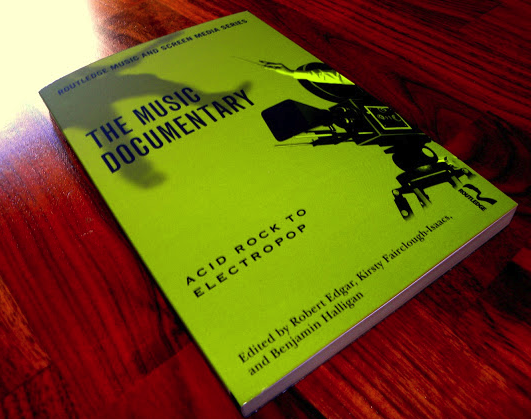 That’s Tony Palmer’s All You Need Is Love.The chapter is first up in a newly published book The Music Documentary: Acid Rock to Electropop edited by Ben Halligan, Kirsty Fairclough-Isaacs and Rob Edgar. You can find out more at the Routledge publisher page. ‘All You Need Is Love’ is a 17-episode documentary on the history of popular music. Expensive to make and expansive in scope, the series was originally broadcast in 1977 in a prime time Saturday night slot on UK commercial TV. It was written, directed and edited by journalist and programme maker Tony Palmer. Palmer formed his filmic sensibility with the BBC’s ‘Monitor’ series as a documentarist concerned with high cultural forms. He achieved renown and notoriety as the ‘Observer’ newspaper’s pop music critic, suggesting that the form should be taken seriously, and for the controversial and impressionistic documentary on rock music ‘All My Loving’ (1968). While his early film was an experimental filmic essay in comprehending contemporary music, ‘All You Need is Love’ developed and crystalised Palmer’s ideas about pop music – its origins, status, direction and value. As Cordell Marks suggested in a preview article in ‘TV Times’: ‘Palmer will be to popular music what Lord (Kenneth) Clark was to Civilisation’. Such claims reveal the contemporary tendentiousness of treating popular music seriously at all, let alone dedicating to it the kinds of resources represented by this series. In many ways Palmer established a type of approach that many subsequent popular music documentaries emulated (and indeed, his work is endlessly appropriated across televisual documentary). In its scope, use of archive material and original footage, as well as Palmer’s distinctive position on popular music, ‘All You Need is Love’ can be understood as an important moment in music documentary and a serious contribution to the historiography of pop. Nonetheless, although the series has been made available on DVD, and the accompanying book is back in print, this work, and indeed Palmer’s wider project, is little studied or even acknowledged in documentary or popular music studies. Our chapter argues that ‘All You Needs is Love’ is a seminal documentary in applying techniques of television history to popular music, in interpreting a series of discourses about popular music’s cultural importance and modes of production, and in establishing pop as a suitable topic worthy of serious documentary investigation. We ask questions about the origins and implications of the programme content and form, both for television and popular music, apply questions about historiography to make assessments of the construction of the past in the series, and relate the editorial line of the programmes to the way popular music studies has changed over the last thirty years. In particular we draw on arguments we have made elsewhere to examine the narrative structure, role of the diegetic and meta-narrator, and the relationship between existing stories about popular music and the visual and aural material out of which the series is constructed. Fundamentally, we seek to demonstrate how seeing television documentaries as mediations of mediations of the past enables us to think beyond the usual approaches to understanding this document of pop’s past.